This post marks a turning point. As of today, I am now a full-time writer. No longer will writing be relegated to whatever hours I can salvage from the rest of my day. I managed to write an entire book that way, but it was a matter of constant, exhausting perseverance. I’ve been moving towards this gradually for years and though recent events put things on fast-forward, ultimately this was long overdue. And now, at last, it’s time to really get down to the business of writing. Writing is about more than simply putting some sentences in a presentable order, and it’s more than getting from ‘Page One’ to ‘The End.’ Writing is about reaching readers – in every sense of the word. It’s about creating something that resonates with an audience in a way that entertains, informs or enlightens. But to achieve that, one must actually reach readers. If no one’s ever heard of you and your writing, it doesn’t matter how brilliant or suspenseful or moving a story might be. If no one’s reading it then you’ve hit a dead end. 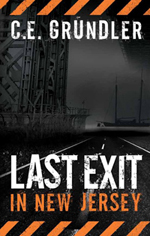 I’m happy to say that Last Exit In New Jersey has been selling steadily despite my random and limited attempts at marketing. I’ve been fortunate, a few review blogs featured my book and their remarks were wonderful, which had the happy effect of attracting readers. A number of these kind readers then went on to post glowing reviews of their own or mention my book in discussion forums, fueling sales even further. Still, my rankings weren’t as high as I would have hoped, and they were clearly lower than some books I’d seen with less than flattering reviews. But why? 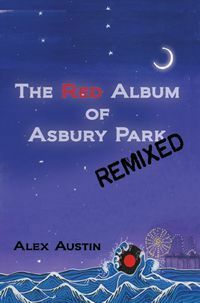 Was this simply a case of anti-Jersey bias, was there something I was doing wrong… or something these other authors were doing right? A little research revealed one constant for each of these authors: they maintained a strong online presence. They were blogging, on Facebook, on Twitter. More surprisingly, most of them weren’t even mentioning their own books! They were simply out there, interacting with readers and other authors. For a social-media introvert, Kristen Lamb’s book provided me priceless guidance I needed. Kristen shows the hows and whys of marketing in a light-hearted, often laugh-out-loud manner that makes her lessons a delight. These days a social presence is essential, but the type of image you project is equally as vital. Kristen leads you through the steps needed to properly brand yourself. (And if you don’t know what that means, all the more reason to read this book.) For any writer trying to reach readers, her book is a must-read and one I highly recommend. Trust me, it will be money well-spent. And above and beyond her book, her blog offers regular installments of insight, guidance and humor. And the best part, in my opinion, is that her entire philosophy is based upon the concept of the more we reach out, the more we help one another, (her barn-raising analogy the other day says it perfectly) the more we all benefit. It’s such a positive, uplifting approach, one that rewards you with new friendships and connections even as you reach new readers and gain fans. I read We Are Not Alone nearly a month ago and I had been meaning to post a review sooner, but time constraints and a cranky computer delayed me until now. With my new schedule I’ll be able to devote more time to applying all I’ve learned (and continue to learn) from Kristen. Some of you may have noticed subtle changes in my blog and an increased frequency of posts. You can reach me and follow me now on Facebook, Twitter and Myspace. And I’m reaching out to others, making new friends, and loving every minute of it. While writing itself may be a very solitary process, being a writer doesn’t have to be. We truly are not alone! Over the years I’ve acquired a few vintage postcards from New Jersey; they’re charming time capsules both visually and by the amusing little messages they share. 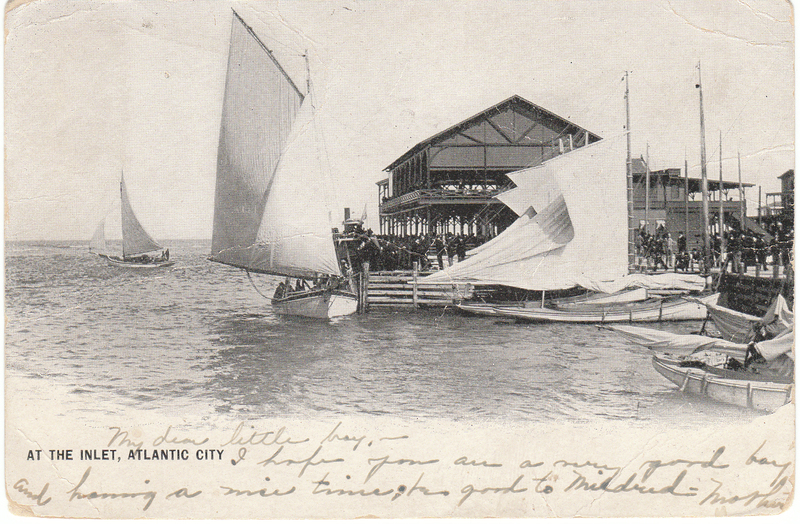 This is easily one of my favorites,with two graceful gaff-rigged sloops under sail and three more waiting scandalized at the dock. Scandalized? Did they do something immoral or shocking? Absolutely not. But reducing sail area of by lowering the gaff or raising the boom is known as scandalizing. As I understand it the expression originated from the term ‘scantelize’, from scantle or ‘make small’. See? You never know what you might learn on my blog. It sounds to me like mom got away for a few days and left Junior at home. 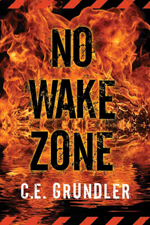 In this strong suspense debut, Seychelle Sullivan owns a salvage tug near Fort Lauderdale, Fla., and makes a precarious living piloting luxury yachts and sportfishing boats in the Florida waters. When her radio picks up a distress call from the Top Ten, she hurries to the scene, hoping to net a windfall. The luxurious yacht is skippered by her former lover, Neal, who seems to have abandoned ship and left a dead body behind. Who is the dead girl, where is Neal, why do the police suspect Seychelle, and how much can she hope to recover for salvaging the yacht? When she finds her modest cottage has been searched and her stash of emergency money is missing, she figures Neal must be alive, hiding from the police or from the girl’s killer. The Top Ten’s representative offers a paltry sum to settle the salvage claim, so Seychelle decides to find out who the real owner is and go to arbitration. As the tension and suspense build, Seychelle’s existence becomes increasingly precarious. Kling vividly portrays a characteristic dichotomy of the Sunshine State-native Floridians trying to earn an honest living in an atmosphere where anything and anyone can be tainted by loan sharks, drug money or worse. 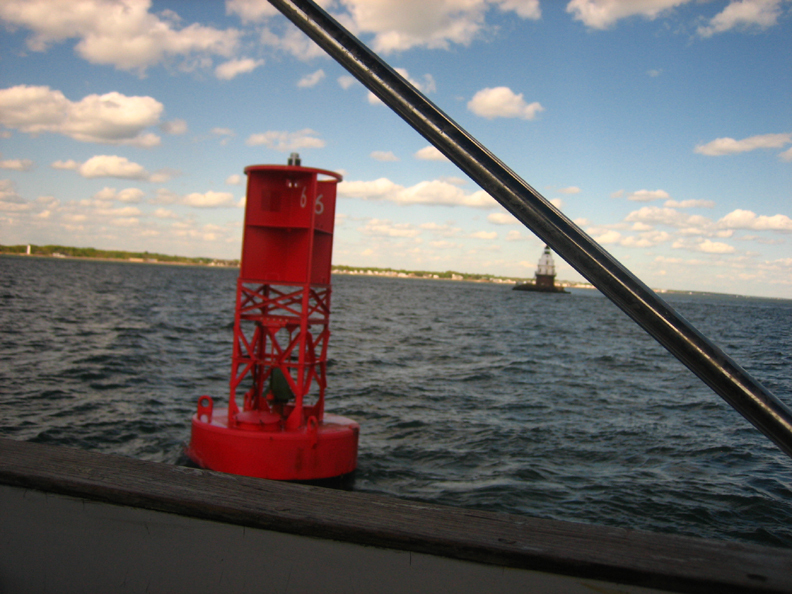 As a female tugboat captain, Seychelle is one of the genre’s more unusual amateur sleuths, and Kling makes her one of its more endearing ones as well. Hmmm. A smart, tough, believable female protagonist, a tugboat captain running a salvage business in Fort Lauderdale, that sounds like my kind character. The story wasted no time diving right into the action and I was immediately hooked. Seychelle comes to life on the pages as both capable and likable, intelligent and take-charge, and Kling does a superb job of presenting scenes in vivid detail, both visually and emotionally, without slowing the story for one second. Without question, Kling knows her territory, both regionally and with boats, and this knowledge made this story all the more enjoyable. Her writing flows in a smooth, un-distracting way that draws the reader right in there with her characters, which is perfect as this is a highly-character driven story. The characters themselves, from Seychelle to her friends, foes and beyond, are all well-fleshed out and multi-dimensional. The dialog is natural and believable, with a subtle range that distinguishes each of the various characters quite nicely. The plot is well paced; it unfolds in layers that weave together in a way that kept me guessing, and though I had my suspicions there were a few surprises that did a nice job of sneaking up on me. And the end wraps everything up in a very satisfying way – there’s no question I’ll be reading more from Christine Kling!